Israeli soldiers invaded, on Sunday at dawn, the Jenin refugee camp, in the northern West bank city of Jenin, shot and injured two Palestinians, and abducted three others. The soldiers stormed and ransacked homes during the invasion, and interrogated many Palestinians, before abducting three, identified as Mohammad Mahmoud ‘Ararawi, 17, Yassin Ali ‘Ammouri, 18, and Mohammad Mustafa Abu Jilda, 18. The invasion led to clashes between the soldiers and local youngsters, who hurled empty bottles and stones at the military vehicles, while the soldiers fired many live rounds, rubber-coated steel bullets, and gas bombs. Medical sources in Jenin said two Palestinians, identified as Yazan Mohammad Ja’aysa, 20, and Majdi Abu Jilda, 15, were shot by army fire. 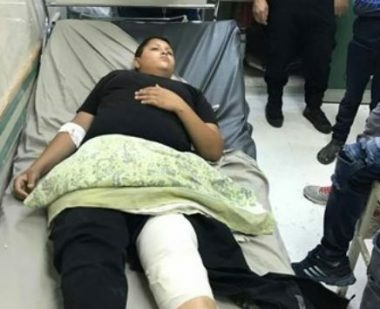 Israeli soldiers invaded, on Sunday morning, the Jenin refugee camp, in the northern West Bank governorate of Jenin, shot and injured one Palestinian, and caused many so suffer the effects of teargas inhalation, before abducting a young man. The soldiers broke into and ransacked many homes in the refugee camp, and harassed several Palestinians, leading to clashes. One Palestinians, Yazan Mohammad Ja’aysa, 20, was shot with a live round fired by the soldiers, while many Palestinians suffered the severe effects of teargas inhalation. Medical sources said Ja’aysa was shot with a live round in his leg and is currently in a moderate-but-stable condition. He was moved to the Jenin governmental hospital for treatment. Furthermore, the soldiers assaulted Yassin al-‘Ammouri, and his family, while searching and ransacking the property, and abducted him. Also on Sunday morning, the soldiers carried out, a limited invasion into Palestinian lands, close to the border fence in central Gaza, and uprooted them. On Sunday at dawn, the soldiers abducted four Palestinians, including two siblings, from their homes in the West Bank governorates of Qalqilia and Bethlehem.